Cloudfone outs tips for an Awesome Selfie. We love Tip #5. Cloudfone outs a list on how you can up the ante of your selfie game. Citing that the struggle is real in getting that awesome selfie. Whatever the reason, bad selfies are unacceptable and a no-no, #sorrynotsorry especially if you want your crush to like it! In order to save you from social depriving self-esteem, here’s the list of essential selfie tricks that you should know and practice so that you can be on your way to awesome selfies! Take this advice literally. Swear. Literally. Find a light brighter than your best friend’s personality and let it highlight your pretty face! Go out, walk towards the window, or if you can’t follow the light, say “Let there be light” and just open the lampshade nearest you! Yes, that’s plural because we really mean A LOT. There’s nothing wrong with having options, right? Especially if you feel that 1 like from your crush = one percent higher at chance meter. So do it, create shots that vary in angle, lighting, or background (or even outfit!) In case you will have a difficult time choosing, what are best friends for? After it has all been said and done, what is projection, perfection without an awesome companion? Let’s face reality, the clearer the selfies, the higher the likes. Right? Tips 1 to 4 can get 200 likes but with tip #5, expect double (as long as you also followed the first 4.) Ready to have awesome selfies that are more on fleek than your eyebrow? #nofilter and #uploadready? 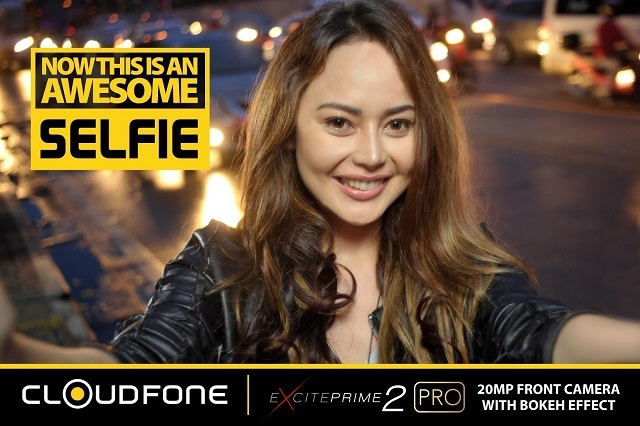 Meet your awesome selfie companion…Cloudfone Excite Prime 2 PRO, a selfie-centric 20-Megapixel Front Camera that with Sony IMX376 Sensor that was co-engineered with Sony and comes with Portrait Mode (Bokeh Effect) (#BackgroundCheck), Rear and Front Light (#FollowtheLight), Face Beauty (#WorkYourAngle), Superpixel, 13MP + 8MP Dual Rear Camera with Optical Zoom. All these awesome camera specs in awesome phone aesthetics. Now say goodbye to the struggle and face the day with confidence as you become selfie ready!